French cinema is all but unthinkable without the presence of Gérard Depardieu, France's highest-paid and most recognizable actor. Enormously fat now but still charming, Depardieu is perfectly cast in Jean Becker's MY AFTERNOONS WITH MARGUERITTE (French title: La tête en friche, roughly “a blank slate”), a chamber piece set in the French provinces about the unlikely friendship between a rustic tradesman, Germain (Depardieu) and a cultivated 94-year-old lady, Margueritte (Gisèle Casadesus). The two meet in the park and bond over a shared interest in the pigeons, to which Depardieu has affixed whimsical names like Thief, Chicadee and Limpy. “This is no typical love affair,” Germain says in narration. Based on a novel by Marie-Sabine Roge, the film paints with delicate brush strokes a complex, sympathetic picture of a man whose manners are rude but who hungers for knowledge and meaning. Margueritte, an avid reader, awakens that hunger, first by reading Camus to him, then by providing him with books to read on his own (as well as a dictionary, over which he amusingly pores). The story is not about an illiterate adult learning to read – Germain can read, but as flashback scenes demonstrate, his education was hampered by abusive treatment as a boy, by his unstable and angry mother (now living near her son in a state of hostile dementia) and by teachers who ridiculed him. His life is not empty, however; he has a pretty, adoring young girlfriend (Maurane) and a close group of friends who gather at the tavern, whose ridicule of him as a “moron” he accepts with equanimity. The film is subtle in its depiction of a man's gradual transformation through the vehicle of literature, in this case primarily by French authors. In Camus, Germain finds a quotation that leads him to a better understanding of his painful relationship with his mother, who treated him horribly but also fiercely defended him against abuse by her lover. Germain muses on the strangeness of his growing affection for this little old lady who “dresses like a posy,” but finds himself growing in intellect and empathy. 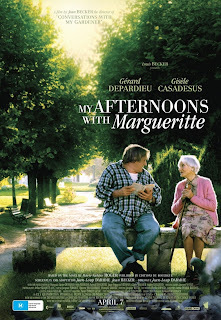 He learns that life is not easy for elderly people; Margueritte's nephew's financial support of her residency in a comfortable retirement home may be coming to an end, a situation that aggrieves Germain when he discovers that her destiny is not in her own hands. Through their regular meetings in the park, Margueritte has become not only his teacher but also the patient, sympathetic mother he never had. 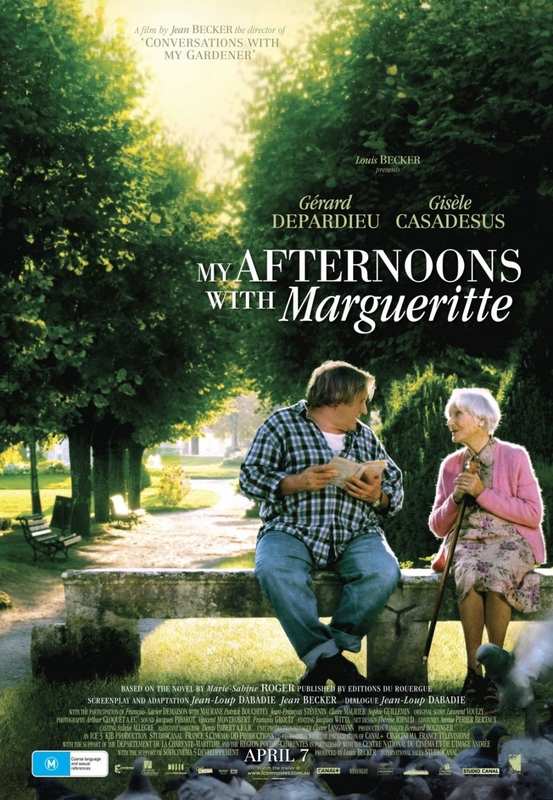 Insightfully written and with fine cinematography by Arthur Cloquet, MY AFTERNOONS WITH MARGUERITTE is a lovely small film that achieves an exquisite balance of vinegar and sweetness. Four out of four stars.